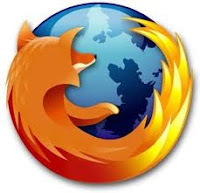 Whenever you reinstall operating system on your computer or laptop, the biggest problem is about the saved password backup in the mozilla firefox. A new installation deleted all the previous saved passwords and it is very difficult to enter the passwords to hundred of sites again, the manual backup to a file is very time consuming so , there is an addon of firefox called "Password Exporter" which helps you to take back up of your save passwords in the firefox. You can backup your entire Firefox profile directory, but if you just want to keep a backup copy, or have a need to sync them with another Computer, the Firefox Password Exporter is all you need. Password Exporter allows both import & export of usernames and passwords saved in the firefox. You can export the passwords to other computer, take a backup copy before reinsatalling the windows or other os, or just import the passwords from a saved file. To install Password Exporter, click on Install Now follow the instructions, and restart Firefox after the installation has completed. 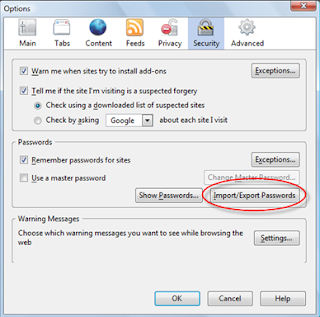 After restarting firefox , Go to Tools > Options and under Security tab , you can access the Password Exporter. Look for the "Import/Export Passwords button". To export, click on Import/Export Passwords button. 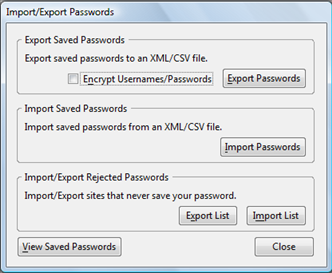 In the Import/Export Passwords window, select the option Encrypt Usernames/ Password Check box ( For safety) then click on Export. Now, save the file, you can save the file either in .CSV format and .XML format. Once saved, you can back it up or import it to another Computer running Firefox with Password Exporter installed or after reinstalling the os you can use it for back up as in my case.